Mick McCarthy's second spell as Republic of Ireland manager began with a laboured victory against Gibraltar in their opening Euro 2020 qualifier. Jeff Hendrick's low 49th-minute shot secured victory at the Victoria Stadium, but the visitors struggled to convert dominance into goals. It was the Republic's first competitive win in almost 18 months but it was hard work against a side ranked 194th. And the score will do little to instil belief that the Republic can qualify. One victory in 11 matches and a perceived negative playing style led to Martin O'Neill leaving his job as manager in November. The Republic endured a winless Nations League campaign and again turned to McCarthy, who led them to the 2002 World Cup during a six-year spell as manager, to transform their fortunes. A European Championship qualifying draw which offered up opening fixtures against Gibraltar and Georgia presented the former Ipswich boss with the ideal opportunity to start his second tenure on a positive note, but the performance in Gibraltar highlighted the difficulties he is likely to endure as he attempts to reach next summer's finals. Gibraltar have never won a major tournament qualifier, having lost all 20 European Championship and World Cup matches they have played, but they had their chances. They are an improved side - they earned their first competitive victories during their recent Nations League campaign. But the fact the Republic were still at risk of dropping points in the closing stages is bound to be a concern for McCarthy, whose side host Georgia in Dublin on Tuesday. Where are the goals going to come from? A major part of O'Neill's downfall was the lack of goals his team scored. The Republic managed just four across their nine matches in 2018 and their lack of cutting edge in attack could easily have cost them in Gibraltar. 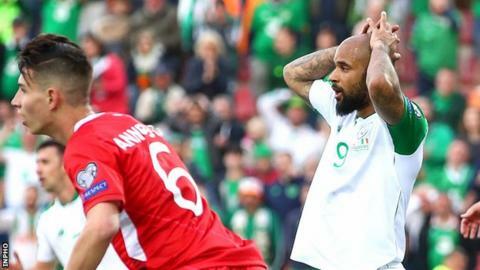 Hendrick's goal, placing his finish into the far corner after a bustling run by David McGoldrick down the left, was Ireland's first in all competitions since Aiden O'Brien's strike in a friendly draw with Poland in September 2018. And the introduction of midfielder Harry Arter for ineffective forward Sean Maguire in the 72nd minute suggested that the new manager had little faith in the other striking options he had available. McCarthy must hope Keane can impart some of his knowledge over the coming months or his side could struggle to make it out of Group D, which also contains Switzerland and Denmark. The top two qualify. Wolves' Matt Doherty had struggled to force his way into the Republic side under O'Neill but the in-form wing-back was deployed on the right wing as part of a 4-4-2 formation that also allowed McCarthy to accommodate captain Seamus Coleman in his customary full-back role. The two right-sided defenders struggled to connect and Doherty was substituted with over 30 minutes remaining as the Republic's attacks were repeatedly hampered by the swirling conditions. The unpredictable wind and the artificial pitch meant the visitors' strike force of Maguire and McGoldrick were often left frustrated in their attempts to find space in a crowded Gibraltar defence. McGoldrick frequently had to drop deep to gain possession, while Maguire struggled to read the crosses as they came into the area. The Irish midfield pair of Conor Hourihane and Hendrick gradually began to dictate the tempo and dominate possession. And it was a Hourihane corner which resulted in the opening chance for his side, but Richard Keogh spooned a weak shot straight into the arms of Kyle Goldwin and the Gibraltar goalkeeper also had to be alert to prevent an own goal by his captain Roy Chipolina. Gibraltar might have scored themselves but keeper Darren Randolph produced a superb reflex save to deny Chipolina as the veteran defender out-jumped Doherty to connect with a powerful header early in the second half. A Gibraltar goal would have caused embarrassment for the visitors. But as it is they finished with a battling win which will be long forgotten if improved performances throughout the campaign take them to Euro 2020. Match ends, Gibraltar 0, Republic of Ireland 1. Second Half ends, Gibraltar 0, Republic of Ireland 1. Attempt missed. James McClean (Republic of Ireland) left footed shot from outside the box is too high. Assisted by Harry Arter following a set piece situation. Tjay De Barr (Gibraltar) is shown the yellow card for a bad foul. Robbie Brady (Republic of Ireland) wins a free kick on the right wing. Foul by Tjay De Barr (Gibraltar). Hand ball by Anthony Bardon (Gibraltar). Attempt missed. Shane Duffy (Republic of Ireland) header from the centre of the box misses to the left. Assisted by Conor Hourihane with a cross following a set piece situation. Robbie Brady (Republic of Ireland) wins a free kick in the attacking half. Foul by Anthony Bardon (Gibraltar). Corner, Republic of Ireland. Conceded by Jayce Mascarenhas-Olivero. Corner, Republic of Ireland. Conceded by Roy Chipolina. Attempt blocked. Seamus Coleman (Republic of Ireland) right footed shot from outside the box is blocked. Assisted by Robbie Brady. Attempt saved. Liam Walker (Gibraltar) left footed shot from outside the box is saved in the centre of the goal. Foul by Robbie Brady (Republic of Ireland). Tjay De Barr (Gibraltar) wins a free kick in the defensive half. Substitution, Gibraltar. Alain Pons replaces Anthony Hernandez. Foul by Harry Arter (Republic of Ireland). Lee Casciaro (Gibraltar) wins a free kick on the right wing. Corner, Republic of Ireland. Conceded by Joseph Chipolina. Attempt saved. Liam Walker (Gibraltar) left footed shot from outside the box is saved in the bottom left corner. Assisted by Joseph Chipolina. Enda Stevens (Republic of Ireland) wins a free kick in the defensive half. Foul by Lee Casciaro (Gibraltar). Substitution, Republic of Ireland. Harry Arter replaces Sean Maguire. Enda Stevens (Republic of Ireland) is shown the yellow card. Foul by Jeff Hendrick (Republic of Ireland). Liam Walker (Gibraltar) wins a free kick in the defensive half. Substitution, Gibraltar. Adam Priestley replaces Louie John Annesley. Attempt missed. Lee Casciaro (Gibraltar) right footed shot from the left side of the box is close, but misses to the right. Foul by Seamus Coleman (Republic of Ireland). Jayce Mascarenhas-Olivero (Gibraltar) wins a free kick in the defensive half. Attempt missed. Liam Walker (Gibraltar) left footed shot from more than 35 yards misses to the left. Assisted by Anthony Hernandez. Delay in match Shane Duffy (Republic of Ireland) because of an injury. Attempt missed. Robbie Brady (Republic of Ireland) left footed shot from outside the box misses to the right. Assisted by Jeff Hendrick. Sean Maguire (Republic of Ireland) wins a free kick on the left wing. Foul by Joseph Chipolina (Gibraltar). Substitution, Republic of Ireland. Robbie Brady replaces Matt Doherty. Foul by Shane Duffy (Republic of Ireland).